Urm, lol and when i do get it, where am i placing it? And how am i downloading the missing file? What missing file? On screenshot it shows you were installing City Living. So you already have "dlc-ep03-city-living.bin". Just open website from my previous post, select that file and wait till it completes. i did that and got "66BCB1848D0B5AD66ED9F57DEFFC597F" as the string hash, not sure what to do with this, or what any of this even means, i don't want to keep bothering you so if you can give me a detailed explanation on what i need to do that would be great and i'm not trying to be rude or demanding or anything, but i'm not tech savvy at all and i never deal with hash files so i'm lost on what exactly i'm doing, it's completed but what steps am i taking afterwards? The hash thing was just to check if the file was correctly downloaded. It doesn't match so it's corrupted. Where did you download it from? Mediafire, Mega or Sendit.Cloud? There could be some upload errors but I'm pretty sure files on Mediafire are 100% correct. So download it again. I just downloaded Get Together and the hash is correct (2E9CF32166A10D1D363BC7B76377F05A). So it's either something on your side or Mediafire had some temporary problems just when you were downloading from it. Please help me! 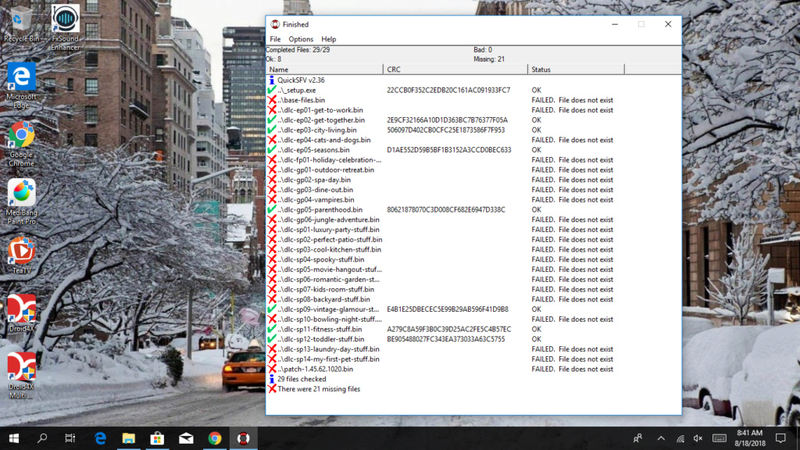 I have done every single thing, I checked all the hashes and they are correct, all the files are in the same folder and I'm still getting the same error, I have no clue what could be wrong, I even did a full reset of my PC and cleaned the drive, what do I do? Download file I've sent you in PM. Extract to the same place where your .bin files are. Run "verify files.bat". Small window should open. When it says "Completed Files : 29/29" take a screenshot and post here. Try installing with "_setup_2.exe" and "_setup_3.exe". If you get any errors, take screenshots and post here. 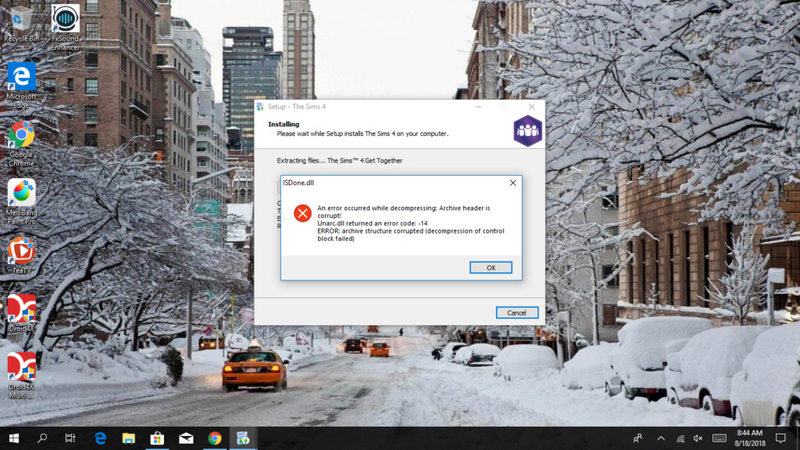 and i use the base game from origin, and both set ups gave me the same error, people say that they get this error with fitgirl's own too but when i try their methods nothing works. BTW what's your system? Win 10? 32 or 64 bit? How much RAM do you have? Does every DLC give you that error? i did all of those and nothing has changed, is there a way for me to get those files like before in the installers? and i got a 32bit win 10 yes every dlc does this to me /: im like ready to give up cuz i've tried every method i could, and dragging them manually won't work? Alright, I think I know what's the case. Sent you "_setup_4.exe". This one must work. Fingers crossed. Yes!! no error! thanks so much for going thru all this for me! 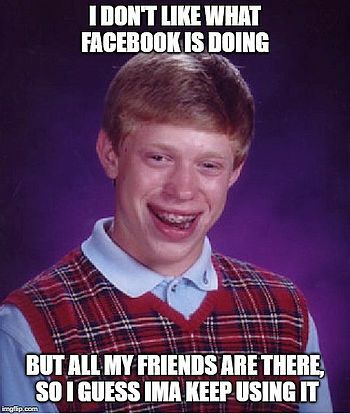 Actually it was my mistake. I thought one program for extracting was 32-bit. It wasn't... I'm going to use this "_setup" from now on.